LandVest chose the Group Manager option which allows any property that LandVest manages to become certified as long as the standard is met. The initial group includes 9 properties covering 35,475 acres in four northeast states. Property size ranges from just under 200 acres to over 15,000 acres. Individual forest owners can choose to acquire their own certificate, but the costs are significantly higher. Due to our experience and success, costs for our group are lower than some of our competitors. Through chain-of-custody, fiber from certified forestland can move through production streams, thus enabling the end product to receive the checkmark logo shown above informing customers that the product came from a certified, well-managed forest and was manufactured responsibly. Local market premiums for certified forest products help to offset certification costs, and in some cases make it a profitable venture. LandVest has been managing certified land for nearly a decade. We are currently the primary manager on over 700,000 acres of certified lands. We have been through numerous audits across the majority of the region in which we work. 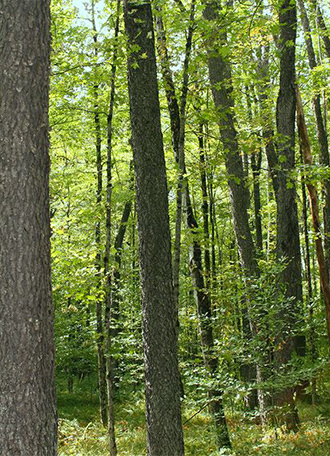 LandVest and the members of its group are committed to managing forests in accordance with the terms of the Forest Stewardship Council’s US Forest Management Standard. This includes a commitment to the implementation of the FSC Principles and Criteria. We have built a company culture focused on standardization of methods, consistency of product, and flexibility in implementation. If you would like to comment, learn more about or join the LandVest Forest Certification Group, please find your local LandVest forester at https://www.landvest.com/timberland-team/ or contact Steve Hawkes at 814-561-1018 or shawkes@landvest.com. LandVest, Inc. specializes in distinctive properties in the most desirable locations, offering services to owners, sellers and buyers.